Oct. 3, 2018 - In 2015, Ghost Ranch near Abiquiú, NM, suffered a catastrophic flash flood, which caused significant damage to historic buildings and the surrounding landscape. The flood damage posed environmental risk to the historic site, as well as to the adjacent Rio Chama watershed. The ABQ BioPark took part in a planting workshop alongside Keystone Restoration Ecology and Ghost Ranch Administration August 3-5. 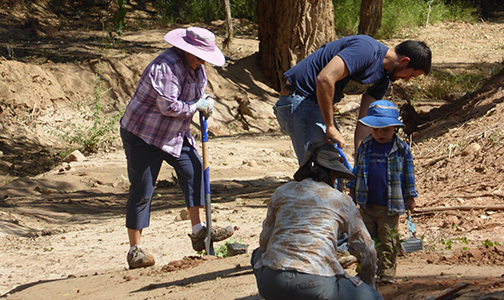 Eight BioPark staff and two volunteers with specialties in plants, arthropods and mammals participated in this special project to help restore the Arroyo del Yeso floodplain and its surrounding landscape. These staff volunteered their weekend to plant more than 1,000 native tree and shrub seedlings and grass plugs that were grown at the BioPark for the project as part of a New Mexico BioPark Society conservation grant award. Additionally, more than 100 willow pole cuttings were taken on-site from Ghost Ranch and replanted on the devastated Arroyo del Yeso flood plain. “The experience was overall, a valuable team-building opportunity to bring together diverse members of the BioPark staff and associated community and to provide an opportunity for people to connect outside of work and learn more about each other and what motivates them as part of the BioPark,” said Maria Thomas, project team leader and ABQ BioPark curator of plants. She also said the project served as a template for establishing a larger-scale plant conservation program at the BioPark, an important consideration as the facility moves forward with the horticulture component of the 20-year Master Plan. She said understanding this process is helpful in developing and maintaining future conservation programming and exhibits at the BioPark such as the Cottonwood Gallery. Plant and arthropod identification and training on plant siting and restoration planting techniques was also conducted by Keystone Restoration Ecologists, BioPark curatorial staff, and Judith Phillips, a licensed landscape architect and member of the Native Plant Society of New Mexico. In addition, staff conducted plant, arthropod, amphibian, bird, and mammal inventories and identified 71 species of plants and 20 species of arthropods. Wild birds, mammals, and amphibians were also noted including mule deer, western bluebirds, brown long-eared bats, and woodhouse toads. 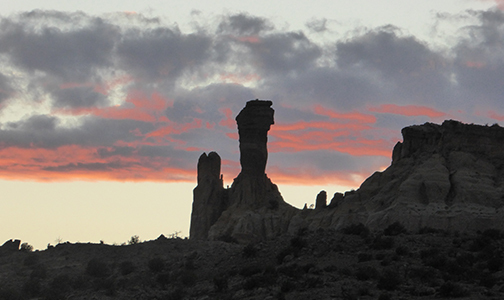 “This was exciting to staff and volunteers, as no one involved in the project could find any background information or research documents, barring paleontology, on the natural history of the Ghost Ranch area before departing on the trip,” said Thomas. “My favorite part of this trip was our plant survey hike, where our garden curators and native plant experts were quick to identify and point out the many plants that occurred in the area, the river ecologists described how the stream and its flooding affected the landscape, and staff from different areas of the BioPark were able to point out wildlife in their areas of expertise,” said Katie Carillo, ABQ BioPark aquarium/Botanic Garden education clerk. BioPark staff collected seed from eight native herbaceous wildflower species and collected seven 40-gallon bags of premium oak mulch for BioPark arthropod exhibits and food. A return seed collection trip occurred at the end of September. 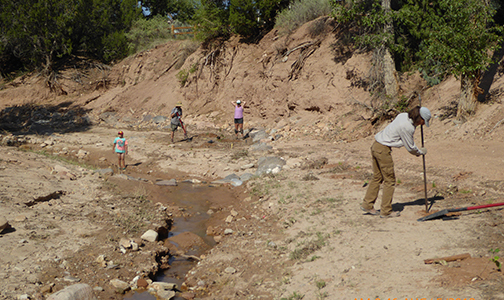 This seed will be used to enhance BioPark plant collections, continue to restore the riparian areas impacted by the flood, and preserve the ecological diversity of New Mexico habitats. 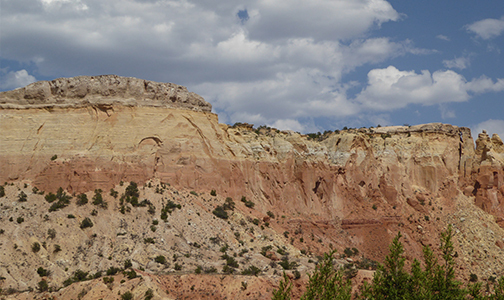 In addition, as the BioPark partner with UNM in climate change studies, the seeds collected and grown from Ghost Ranch can be used to provide important data about how climate change will affect our native ecosystems.